Fire and purification were an important part of the Imbolc festival. The lighting of candles and fires represented the return of warmth and the increasing power of the Sun over the coming months. 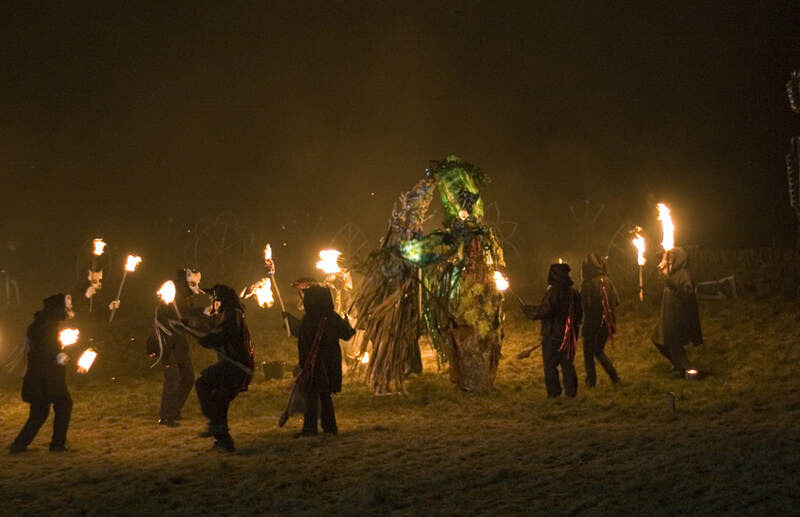 Below is shown an Imbolc celebration in Marsden, West Yorkshire, from February 2007. EDITOR'S NOTE: Hugo da Nóbrega Dias hails from the Celtic region of Portugal known as Galicia, an area which also extends into Spain. It was from here that many historians believe the Celtic race left for Ireland. Hugo provides some wonderful photographs to accompany his story on the ceremonial fires of the Celts. Though an ancient ceremony, the fire burning has spread across Europe and even to America. 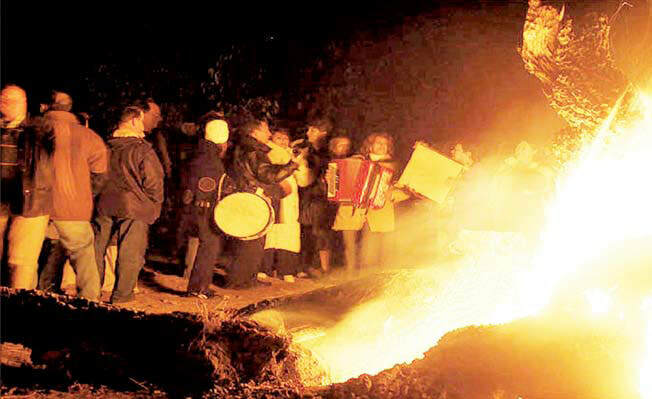 ​Music and merriment accompany this ceremonial fire at Madeiro de Penamacor, Portugal. Since man started to control fire, it became an element of great devotion and admiration, and was thought to have magical powers. Its capacity to reduce most other elements to ashes gave it the status of life regenerator, becoming one of the cycles of life itself – as ashes are symbolic to the beginning of life. With such a quality, it soon started to be used by man in his ceremonial acts. Having the capacity to illuminate, it was associated with light and with the Sun. When man started to understand the cycles of the year, noticing that seasons followed concrete patterns, he managed to forecast the forthcoming of seasons by watching the sky and the movements of Sun. Thereunto, he built many stone monuments in specific positions that marked the passage of the Sun at the exact moment of solstices and equinoxes. Huge stones positioned mellimetrically, some of them with holes, others with narrow spaces between them, allowed man to know about the precise dates of this astronomical phenomena. These constructions became places of great mysticism and were probably the first sanctuaries humans had. As man was able to preview the upcoming of seasons, their arrival started to be celebrated. He could plan seeding and harvesting, and cults began to develop around the these cycles, turning these dates into festivals. In summer and winter, when the peaks of light were most noted, fire played a main role in these ceremonies. On the longest day of the year, bonfires were lit and this practice came to be known as St. John’s Eve, marking the summer solstice. On the other hand, on the winter solstice the resurrection of Sun – the sol invictus – was also commemorated, for the Sun had risen again and marked a new cycle of life. This reached us as what is now known as Christmas and later known as Yule. Yule was, as most know, related more to a period between the 6th of December and the 6th of January – St. Nicholas day and Epiphany. In this period of time, bonfires were lit and kept along all the Twelve Days of Christmas. This tradition of bonfires and fire festivals dates back to Stone and Bronze Age and from here sprang the Yule Log and all the lights associated with Christmas time. In fact, all this lighting is the celebration of the victory of light over darkness as the Sun rises up again on the 25th of December after setting at the same point on the horizon for the three previous days. Yule Log is still a ritual happening nowadays all over Europe. In Gallaecia – what is now Galicia in Spain and the northern region of Portugal – there is a reminiscence of this ceremony and on the 24th of December a huge tree trunk is lit up at the center of villages and towns. Around this date, people begin to carry the trunk to the center of the village, usually on a wooden car pulled by oxes. Tradition says that boys must steal the trunk of an old tree from someone, and in some places the car or truck must be stolen as well. It is the “Madeiro” (from “madeira”, wood) or Cepo de Natal (Christmastrunk). Christmas Eve is spent around this hugebonfire, dancing to the sound of bagpipes, drinking and eating. Commemorations last till sunrise and usually end with young drunk boys climbing the church tower to ring the bells and awaken those who went to bed early. The trunk is kept alight the Twelve Days of Christmas in some cases and in others it lasts only the night of the 24th and it is lit again on New Year’s Eve. These ceremonies happen year after year to mark the entry in a new cycle of life, a new beginning. Fire acts as a purifier to keep the soul away from bad spirits and to symbolize the ridding of old things and problems. For those who spent the 24th of December around a bonfire, or the 1st February in front of an Imbolc ceremonial fire, I wish you a wonderful, happy 2018. Ceremonial fires from Madeiro de Penamacor, Portugal.